I have a struggling reader and English on a Roll English Grammar Teaching Method was a unique way to work with him on his reading. This set includes 40 color coded cubes in a sturdy plastic container. The instruction manual by Linda Hopkins Koran gives you a great introduction, cube guide and 37 grammar lessons to use the cubes on. As the teacher I worked on making myself familiar with the cube guide. Each colored word represented a different part of speech such as pronoun, noun, articles, verbs, adverbs, adjectives. It also included question words and punctuation. My son is a hands on learner, and I think that is partially why he is struggling with reading. There isn't anything tactile about reading typically, just letters on a page. He does great with math when he can use unifex cubes, or even with science when he is mixing up supplies or holding on to what we are studying. 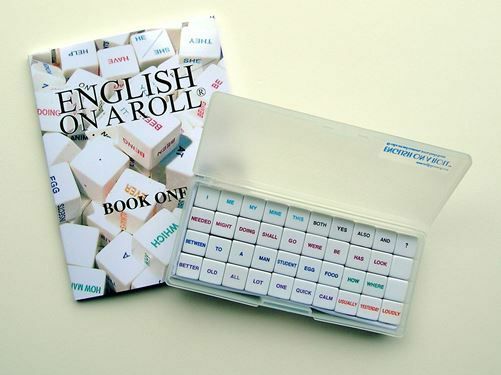 English on a Roll is taking that same concept and bringing it into the grammar world. The manual makes this very teacher friendly, without having to know English in depth. Each lesson lets you know what cubes you need as well as what pages you need to copy. (which the copyright allows for home use). It includes a section on tips and techniques which are helpful the further you get into the manual. The manual even explains to the teacher in detail on how to teach. This is great for new homeschool teachers who are unsure of how to even begin to teach grammar. There are also games to use to reinforce the new concepts. There are written exercises to finish off each lesson. The student is using tactile means, but also listening, visual and written as they begin to learn basic grammar. Sounds much like grammar rather than reading right, for a child who is struggling to read? These basic grammar words are the ones he needs to learn to read to have a good start at reading. Because I believe he is a right brained learner, phonics isn't working for him, he needs something like a cube to memorize the words and which ones are on it. Just goes to show you how differently some kids learn. He is my second right brain learner so thankfully this time I had an idea what was going on. Lesson one starts with just one cube of pronouns, which gave my son confidence since they were I, You, He/She, It, We, and They. Didn't take long to get through that lesson. Lesson to introduces the "Be" verb, which is helpful to learn right from the start to utilize the verb form of the sentence. How can you have enough nouns to use? There are a few cubes that are blank, and some removable labels to have words you need just for that lesson. Using the suggestions in the manual I was able to utilize the various forms of learning, to help reinforce the words with my son. Writing them on paper, having him find the correct dice, having him verbalize the words and sentences, and having him write on the handouts. I think the variety helps make it stick much better. We would stay on a lesson until he had mastered it. I didn't move on until he knew the words on the dice. Though it did seem the next lesson he would forget some of them but we would just review them again. This is a tool I plan on working through to the end. Not only is it helping him learn to read some of the basic words, it is teaching grammar at the same time, something I didn't think I could teach him until he was a good reader. It is helping me feel like we are catching up some.